It’s summer, it’s hot and this is the perfect way to cool down. 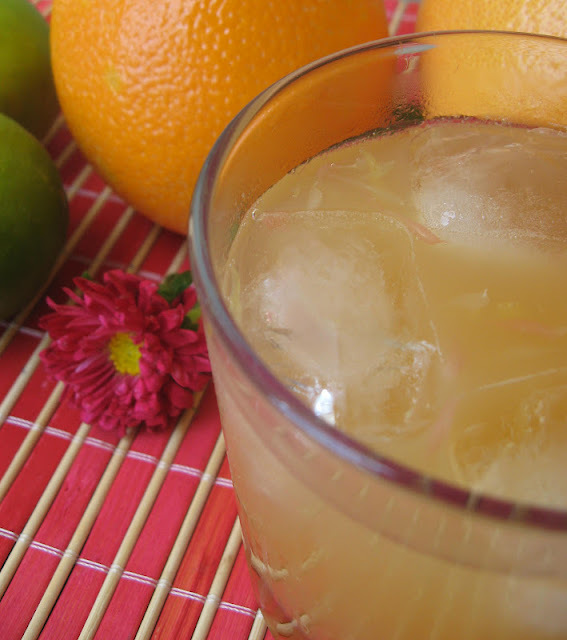 I love agua frescas and they go especially well with the fragrant spiciness of Mexican and Caribbean food. 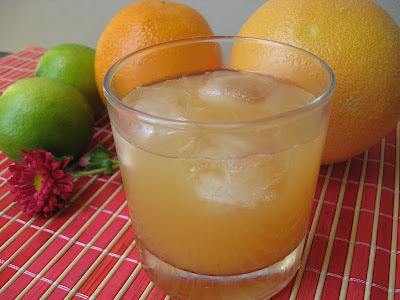 Strawberry and tamarind agua frescas are also good, but this time I made a citrus combination from ruby grapefruit, juicy Tahitian limes and navel oranges. Served with ice, these drinks keep the summer heat at bay. And if you're feeling a little naughty, add a shot of rum or tequila to the mix. Recipe from ‘Mexican’ by Jane Milton. Makes 2 litres. 1. 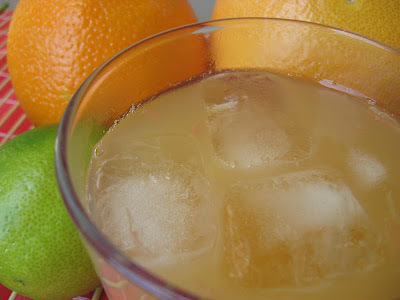 Squeeze the juice from the limes, oranges and grapefruit. Pour the mixture into a large jug. 2. Add the water and sugar and stir until all the sugar has dissolved. 3. Chill for at least 1 hour before serving with ice and fruit wedges. Note: Some fruit pulp may collect when squeezing the juice. This should also be used, once any seeds have been discarded. Will keep for up to 1 week in a covered container in the fridge. When I was a teenager, we learnt how to make lemon curd in home economics and I loved the tangy, rich results. Ever since, I’ve wanted to make passionfruit curd instead, but for some reason I always put it in the too hard basket. Well, it turns out it isn’t that hard at all! I made passionfruit curd this evening and it took about 20 minutes to prep the passionfruit pulp and make the curd. Too easy. The results were thick and sour-sweet, and fragrant with passionfruit pungency. Recipe from Gourmet Traveller December 2008. Makes 1½ cups (375ml). 1. Process pulp in a food processor to release pulp from seeds, then strain through a fine strainer to yield 250ml juice. 2. Transfer to a heatproof bowl, add egg yolks, sugar and butter. Whisk to combine. 3. Stir continuously over a saucepan of simmering water until thickened (3-5 minutes). 4. Cover with plastic wrap, set aside to cool, then refrigerate until firm (2-3 hrs). 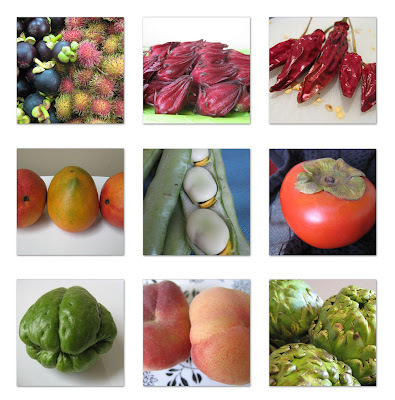 This is my first completed Food Challenge for 2010 and my first Weekend Herb Blogging contribution too. Our WHB host for this week is another Anna, from the blog Anna’s Cool Finds. Visit her blog for the recap. My WHB ingredient is, of course, the passionfruit. Another amazing contribution to the culinary world from the bounty that is the American continent. The passionfruit is native to Brazil and Argentina, but they grow so well in Australia. As a kid we had passionfruit vines and when they fruited we were inundated with little purple globes of tangy pulp. I’d go for a swim and on my way inside from the pool I’d break off a few fruit and bring them inside for my mum to cut through the tough shell and expose the brightly coloured pulp. Then I’d gorge. We’d have so many passionfruit that my parents were always trying to give them away. They were weeds in our garden. This goes a long way to explaining why I feel slightly put out when I have to pay $1 per fruit at the supermarket. But this week I got them en masse for very little so I decided to make the most of it. This is my first recipe of the year! And such a lovely one too. Fish always makes me think of summer, but the addition of smoky bacon and the oven roasting method of cooking make this equally viable in winter. I made this recipe one evening from the bits and pieces in my fridge and I was just ecstatic at the outcome. Sometimes the best dinners are those that just ‘happen’ on you. 2. Heat olive oil in frying pan. Fry garlic until soft. 3. Add tomato paste and fry for 1 minute. 4. Add tomatoes, salt, sugar and pepper and gently fry until softened and forming a sauce (about 5-10 minutes). Set aside in serving dish. Keep warm. 5. In a clean pan, fry ocean trout, skin side down to crisp skin. Then flip and cook flesh a little (approximately 2 minutes skin side, 30 seconds - 1 minute flesh side). 6. Wrap bacon rashes around fillets and top with pepper. 7. In a baking dish, cook in the oven for 15-20 minutes or until bacon is crispy and fish is cooked through. Sometimes, on our travels or eating out at restaurants, I stumble across dishes that stick in my mind long after the experience has ended. I mull over the flavours and ingredients and wonder how to make it again at home. This post will now be a new fixture in my blog, where I list amazing dishes that I plan to replicate at home. It won't be an exhaustive list of the most wonderful things I've eaten, but rather the dishes that translate to a home kitchen. Hopefully I'll be able to reproduce some of them again, or at least get as close as possible.